First and foremost, Justice Machine looks like it was ripped straight out of the pages of an old coming book. This art style clearly separates it from any superhero themed slots claiming to be its competition. 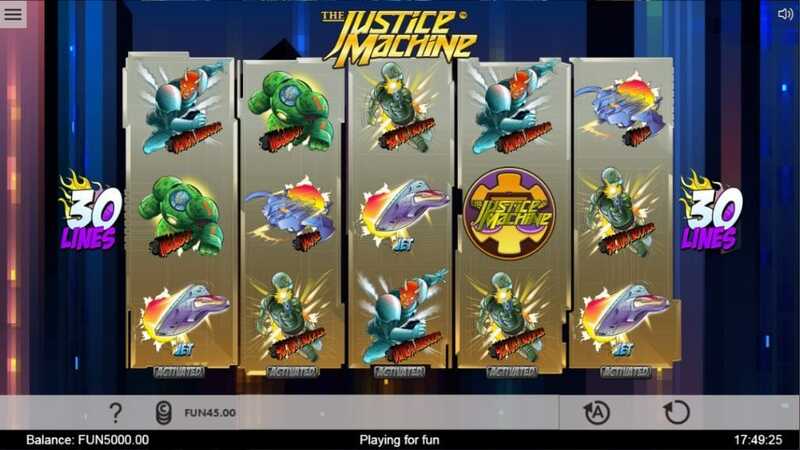 From 1x2 Gaming, we would like to introduce you to the Justice Machine, a 5 reel by a 3-row slot that is chocked to the brim full of action and excitement. try new slot games that have stories tend to be the most thrilling for us, just because we tend to play more in order to find out where these stories go. Justice Machine has quite the story, with all of the characters/symbols having clear motivations/backstories that we won’t spoil for you here. The RTP in this slots sits pretty at 96% giving you quite the return on your slot investments. Bets in this slot can also be placed from as little as 3p, making it incredibly accessible for beginners. 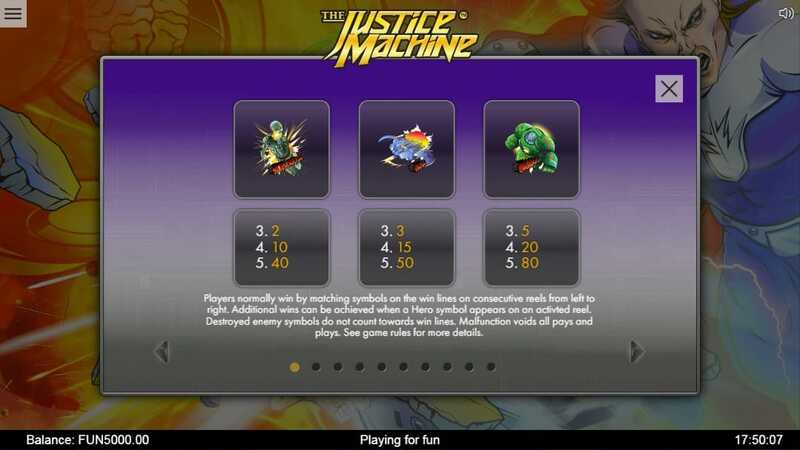 Be sure to check out the rest of our review of Justice Machine below here on SlotsBaby. 1x2 Gaming work a lot on playa experiences rather than worrying about their bottom line, it’s this sort of mentality that has made them incredibly popular with online slot gamers, and is gaining them more fans on the daily. We could list off a bunch of their slots that we personally enjoy, but hey where would the fun be in that? Also every slot that these guys make tends to be an instant home run so you might as well play all of their games! Be sure to keep your eyes open when it comes to new online slots from these guys, you never forget your first spins trust us. If you love promo's, check our new slot bonuses today. Each of the heroes/symbols on these reels offer something completely different if they are matched within a specific pay-line. These additional features encourage repeated play on these reels in order to fully utilise their capabilities for your own financial gain. For example, should a talisman symbol land on the reels somewhere, then you will be given a random bonus prize of some kind, this can come in the form of additional pay-outs to even having random symbols acting like wilds. We should note that wilds and scatter symbols do appear in this slot too. Wilds will substitute certain symbols on the reels, which in turn will leave you with more scatters which then have the ability to grant one free spins. Free spins have multipliers attached and offer players even more chances of hitting those high notes/scores.